This is my favorite rosepath rag rug of all time! (Have I said that before?) I like the unexpected color changes that occur in the design. While the main rosepath pattern is woven in a yellow batik, the background tabby changes from pink to a mixed print, and then a single brown stripe outlining solid blue. Single row of dark brown tabby serves to outline the central rosepath motif. The other thing I like about this design is the repeated uneven plain weave weft stripes–three rows green and two rows black. The ideas for color changes and uneven stripes came from looking at rugs in my Swedish weaving books. 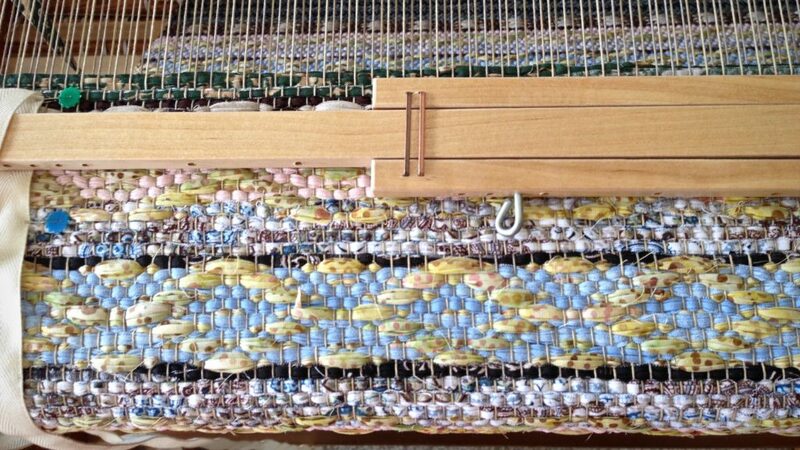 I have another rug to weave on this warp before we get to see this “favorite” spread out on the floor. Every weft, including the rosepath pattern weft, goes around the selvedge warp ends. 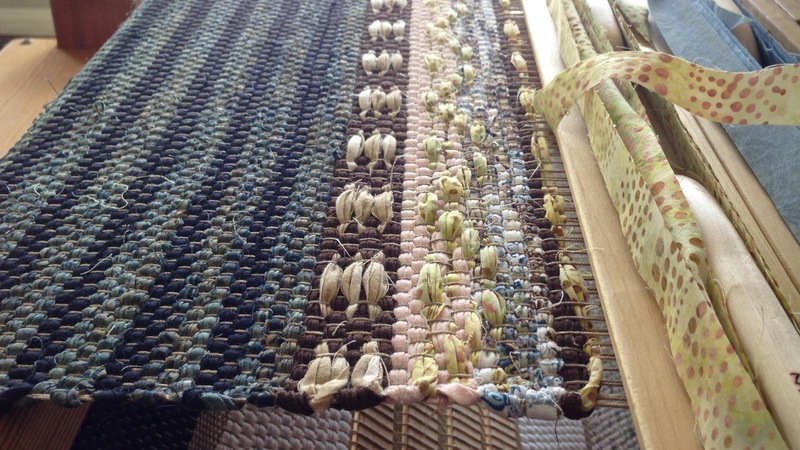 The inactive yellow batik fabric strip is carried up the selvedge through the active wefts. Designs start with ideas. Who designed the intricate workings of the human body, or had the idea of putting planets together in a solar system? The universe is amazing, with every explicit detail honoring the Creator. Designed to operate on the faithful love of the Lord, this universe is a divine idea brought to life. With the glimpses we see of his perfect design, we can’t help but give our Grand Weaver the admiration he deserves. May you have plenty of favorites to weave. Julia, Thank you! I’m glad you like it. Thank you so much, Janet! I appreciate your sweet comment.